I thought Jason McCall’s first two books Silver (2011) and I Can Explain (2012) were cool, good. His third book Dear Hero, (2013), though, really drew my interest. Perhaps, the subject matter gave me more entry points. McCall reveals his capacity for connecting a wide range of texts (oral, written, and cinematic) as he references contemporary pop culture heroes in the same volume and often in the same poems with Greek and biblical heroes. McCall's poems reminded me of the experience of reading Colson Whitehead's New Yorker essay "A Psychotronic Childhood." In that piece, Whitehead reveals the dozens and dozens horror movies that he watched and how he immersed himself in the genre. Dear Hero, is evidence that McCall is immersed in the worlds of superheroes. And more. At a few different points, he mentions the vexed relationship between comic book narratives and their black audiences. In "Because Black Kids Can Read," he assumes the voices of African American characters who possess special powers, who are "Like Iron Man,/ but with more guns and less / brains or the Green Lantern who willed / himself out of the ghetto." In the guise of War Machine, Falcon, or Steel, he "won't save the day," but will "only keep the action going" while the lead (white) hero "recalibrates his armor." 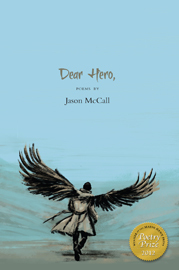 Toward the end of the volume, McCall has a series of poems about blockbuster movies with their superheroes coming to Tuscaloosa, where McCall lives and works. Thor, X-Men, the Lantern, Transformers, Captain America, and Conan all make their appearances. And we know this because they're there in McCall's volume being directly addressed, questioned, re-imagined, and chronicled in verse.